The European Commission now mandates day time running lights (DRLs) and due to their benefits LEDs are almost exclusively used for this purpose; they now have an even brighter outlook. By Michael Weitz, System Engineer, TI. Today, LED technology is rarely used for low- and high-beam lights but it is expected that the percentage of vehicles with so-called full-LED headlights will increase. Besides the purely aesthetic freedom of design offered by LEDs, this technological shift will enable the introduction of enhanced adaptive lighting systems, also known as Adaptive Frontlight Systems (AFS). LEDs used in vehicles require electronic monitoring and control systems which will eventually lead to dramatic changes in vehicle system architectures. Existing vehicles that are currently equipped with LED lighting may still have a body ECU from the previous generation. The LED driver electronics in the headlight must therefore be adapted to the conditions of the existing architecture. For instance, it may be necessary to generate an additional load current. Otherwise, the significantly lower current consumption of the LEDs might violate the ECU’s diagnosis thresholds which were set for incandescent lamps. The LED driver circuitry, in turn, must adapt its regulation parameters to the binning of the LEDs and their operating temperature in order to avoid any visible colour shifts between the headlights and other lighting functions. The future architecture is depicted in Figure 1. In this configuration, a Body ECU designed for LED headlights communicates with the Light Control Unit (LCU). LED diagnosis is performed by the LCU. There are no switched lines leading to the headlight, which has its own connection to the vehicle’s 12V electrical system instead. The use of a microcontroller results in much more flexibility for controlling the LEDs depending on binning and temperature. As mentioned above, a variety of new opportunities and functions is enabled for LED-based adaptive headlight systems. In addition to the standard light functions including marker lights, high beam, low beam and turn signals, new functions including bending lights, highway headlights or glare-free high beam (matrix lights) become available. Furthermore, Advanced Driver Assistance Systems (ADAS) control additional functions like infrared beams for night-vision systems. Lighting functions in LED-based headlights are usually implemented using multiple LEDs for each purpose. These can be organised as long serial LED strings or shorter LED strings driven in parallel. 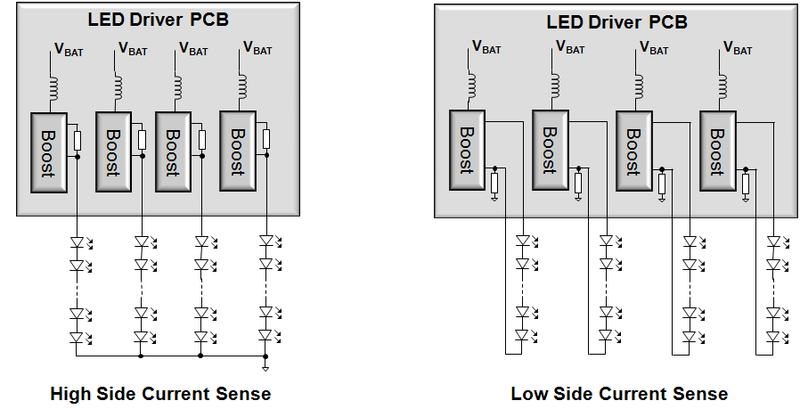 As the main light function demands a lot of power and high currents, a switched LED driver is required in order to minimise the losses occurring within the driver. Common topologies and circuit components are depicted in Figure 2. A step-down (buck) converter is the topology of choice whenever the LED string’s forward voltage is always lower than the minimum voltage of the vehicle’s electrical system. If very long LED strings are used, a step-up (boost) converter can be used instead. 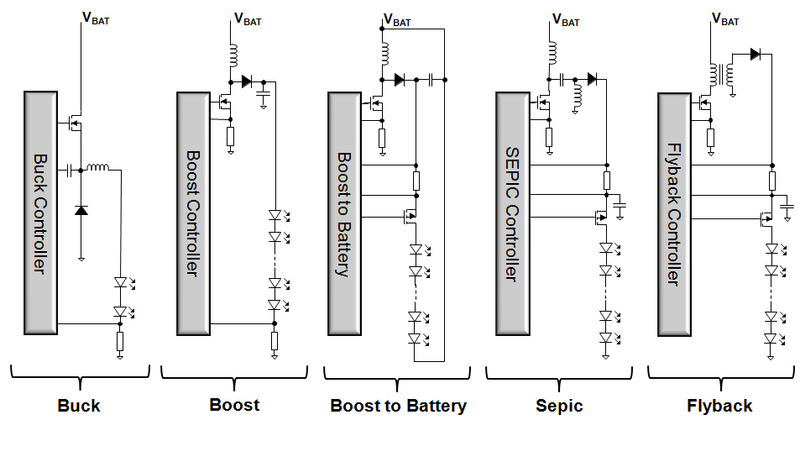 In all other cases, the forward voltage of the LED string may be higher or lower than the voltage of the electrical system, mandating the use of topologies capable of operating in the buck or boost mode (boost-to-battery, buck-boost, SEPIC, flyback). In addition, it must be determined where the current will be sensed for the control function (see Figure 3). In most cases, the LEDs will not be mounted on the PCB. It will thus be better to provide a common ground connection for the cathode side of multiple LED strings, eliminating many wires leading to the PCB. In addition, a short to ground at the anode side of an LED string can be controlled much easier using this configuration. Additional options are available for the overall architecture of the driver circuit. For instance, the headlight can be implemented with a single-stage or a two-stage driver circuit. In the single-stage version illustrated in Figure 4, there is only one switch-mode controller stage between the supply voltage and the LED string. Each LED string can then be operated with the controller topology optimally suited for the specific application. This is the preferable solution considering the efficiency of the overall solution. A different two-stage approach is shown in Figure 5. Boosting the voltage of the electrical system in the first stage enables the use of a single buck topology for all lighting functions. It is therefore possible to use a modular architecture based on identical buck converters for different LED strings. This also enables a more universal use of the LCU. A wide portfolio of standard LED drivers is readily available for the variants and options mentioned above. Some of these drivers are implemented as converters with on-chip power transistors, while others are implemented as controllers providing on-chip drivers for external power transistors. In addition to the switched LED drivers, a selection of linear LED drivers is available for low-current lighting functions which will typically be used for interior lighting or rear lights. Control and diagnosis functions will be migrated from the central control unit to the control units of the new LED headlights. While LED-based headlights require more electronic control functionality, they provide additional opportunities and more freedom of design. LED driver components for these new applications are readily available. A well-designed architecture must be adapted to the specific requirements of each system. Author profile: Michael Weitz is the System Engineer - ASSP, EMEA Sales & Marketing for Texas Instruments. Weitz has been with TI for over 15 years, holding several technical positions. His main focus now is on automotive power and lighting applications.